Ruby Starr is thrilled that her book suggestion for her lunchtime book club, The Unicorns, is a big hit. Everyone loves From the Mixed-up Files of Mrs. Basil E. Frankweiler! And Ruby wishes she could spend the night in a museum just like the book's characters. Her wish is granted when she finds out her class is going on a field trip to the local museum! But when things start going wrong, Ruby's not sure she'll get the ending she was hoping for. 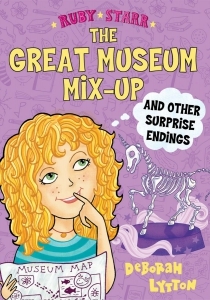 Dork Diaries meets the Ava and Pip series in this funny and authentic third book in the Ruby Starr series.